Printable Black & White PDF Printable Color PDF More Paper Dolls & ClothesSo, I grew up watching Xena: Warrior Princess. I blame my love this old TV show for my love of totally improbable fantasy and pulpy warrior armor. I do realize that this armor would be completely useless in a fight, but that didn’t mean it doesn’t look cool and wasn’t fun to draw. This is my second set of pulpy armor and I think I should really draw some real plate armor one of these days. For this armor, I wanted a thematic shape that could hold the whole design together and I chose this very simplified paisley/leaf motif that you’ll see on the belts on her trousers and in the pummels of the weapons. Once I had that shape, I tried to add color and create something that felt like it could be from one of the old Prince Valiant comics. I confess that I ended up thinking there was something a little East Asian in the whole design, but I can’t really explain why it feels that way to me. It certainly wasn’t my intention when I started. Meanwhile, support the blog through Patreon if you enjoy it. 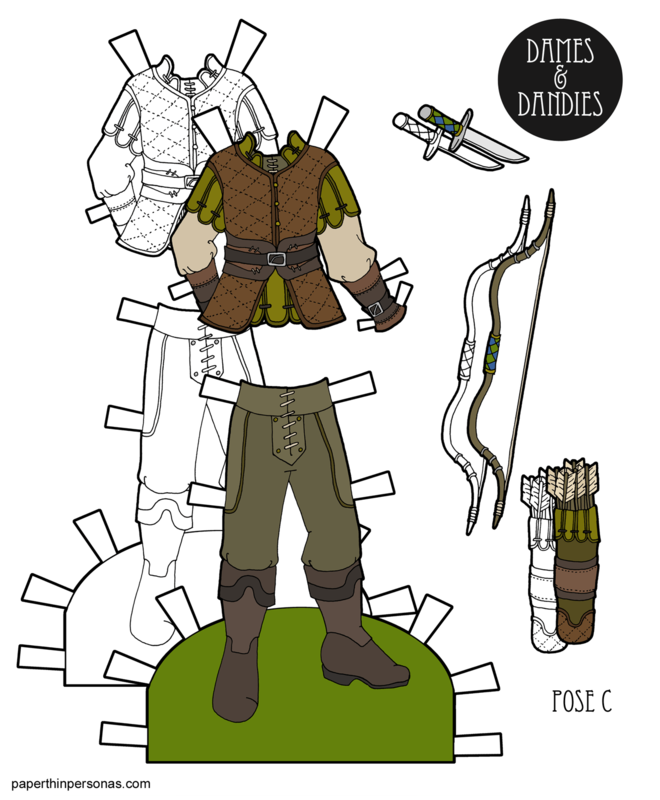 And I am curious, should I draw some full plate armor for my lady and gent paper dolls? Let me know what you think in a comment. So, I saw this image on Pinterest and I thought “Robin Hood” and then I decided to draw it. Nothing more complex than that I’m afraid. I usually try not to copy things as closely as I did on this one, but I just really loved the tunic design. I changed the colors to green (though there’s a blue version on my Patreon page for Patrons). That’s really all I got. Leave me a comment and let me know what you think. I always love hearing from you guys. 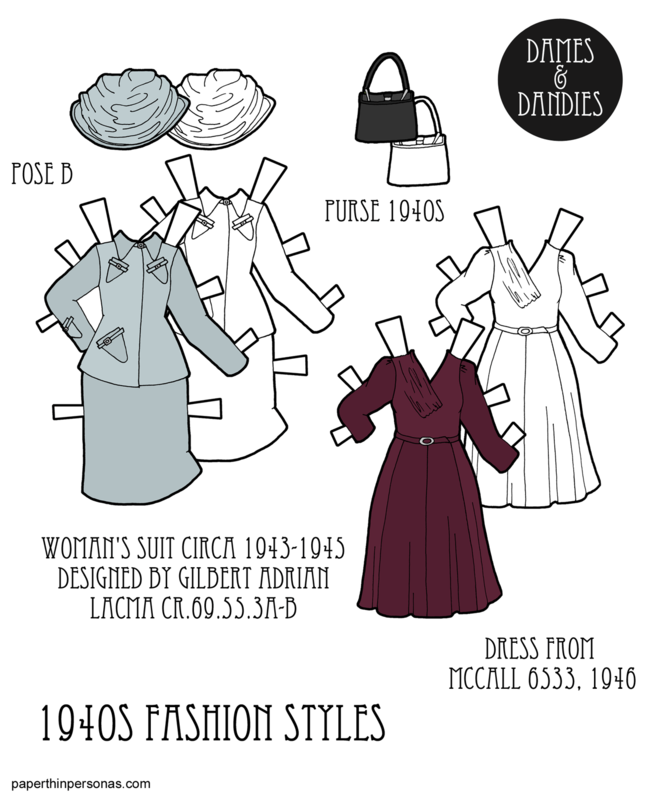 Printable Black & White PDF Printable Color PDF More Paper Dolls & ClothesSo, one thing I’ve kinda missed doing were theme weeks. So this week is all 1940s! We’re starting with a 1940s paper doll in this version of Beatrix, wearing a girdle and bra and with her four pairs of shoes. Wednesday and Friday will be 1940s dresses to go with Beatrix. So, I went to look for the hairstyles of Hollywood black actresses of the time, as Hollywood was a leader in fashion during this era. I settled on this image of Theresa Harris. The still is from the 1948 thriller, “The Velvet Touch.” I don’t know much about Harris, except what I read on her Wikipedia page. She sounds like a strong interesting woman. The paper doll’s 1940s underwear is based on a set sold from Sears in 1947. I used the Dover book, Everyday Fashions of the Forties As Pictured in Sears Catalogs. I chose this underwear to draw because I could draw the paper doll pants, someday. Most girdles I saw would not have made pants very viable and pants were finally coming into their own in the 1940s. 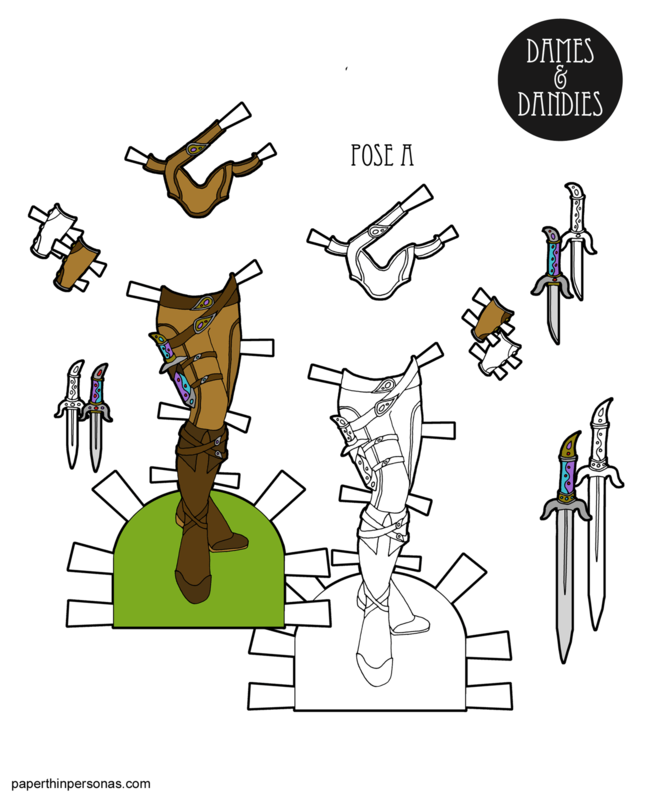 The paper doll’s shoes are all from various museums. She is wearing this pair from Gucci at The Met. And from top to bottom, she has a pair from 1942 from the V&A, a pair from the 1940s also from the V&A and a pair from 1942 from The Met. I tried to chose shoes that were interesting, but also typical from the period. You can see a bunch more shoes from my 1940s Fashion on Pinterest. Any further questions? Let me know in a comment. I always like hearing from you guys. 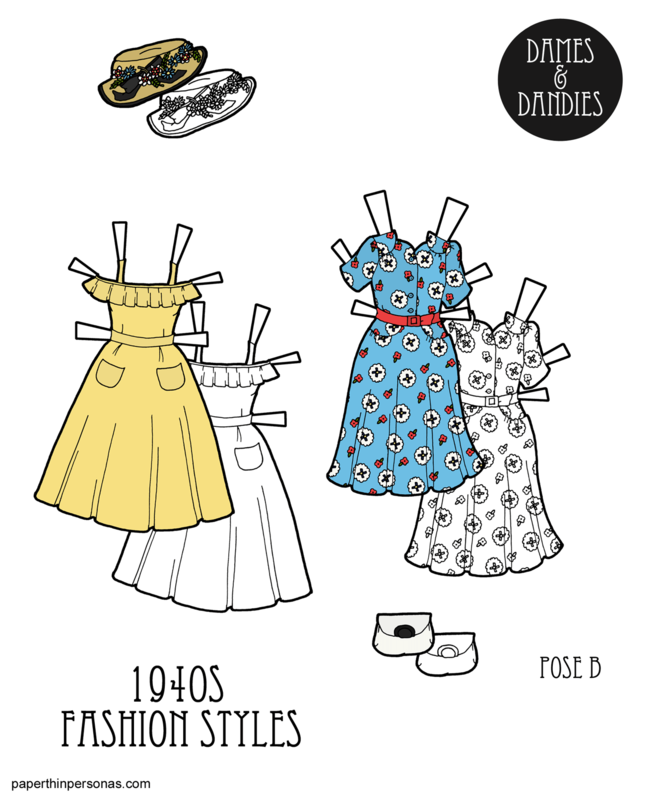 Printable Black & White PDF Printable Color PDF More Paper Dolls & ClothesI’ve stopped doing full paper doll sets with complex layouts, but I’ve found I missed the mix and match modern sets I used to create, specifically keeping to a limited color palette. 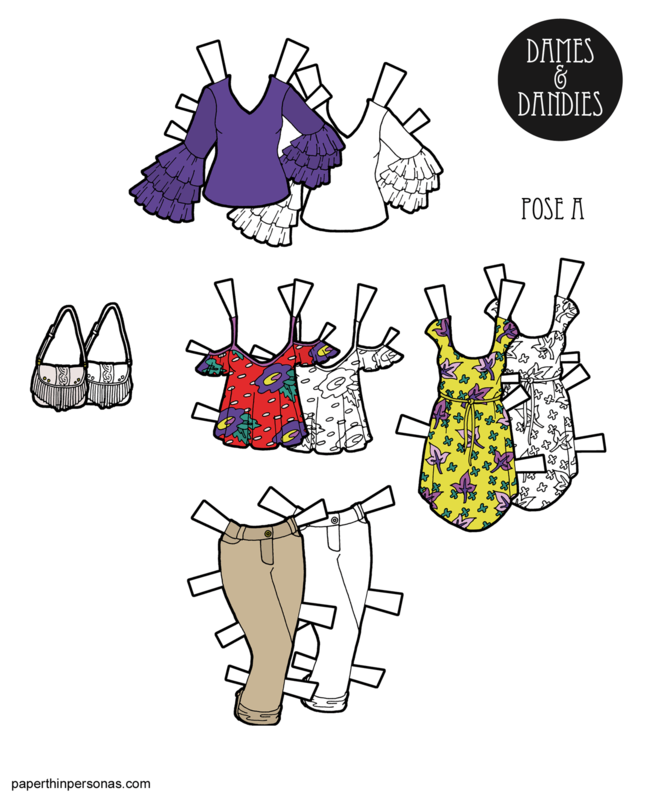 So, I decided to create a little micro-summer wardrobe here for the A Pose paper dolls. These five pieces can all mix and match. They also share color from the Spring 2018 color report. I love color. This should shock no one. One of my favorite things is looking at Pantones color reports each season to see what they’ve predicted for the coming season. The Spring 2018 color report had some really lovely colors in it. Ultra-violet is the Pantone 2018 color of the year. Since I love purple, I’m perfectly content with this choice. I’m not sure I buy all of Pantone’s hype about the color, but I think it’s pretty. So, I used the Ulta-Violet color in every piece, except the pants (which I made one of Pantones suggested ‘classic’ colors) and the purse which is a very pale petal sort of mauve color. It looks white, I know, but I swear it’s a light pink. Very light pink. I tried to be trendy as I could in these pieces. I’ve been seeing a lot of fringe on handbags and a lot of abstract, but almost tropical feeling florals. The off the shoulder top is still in, I think? And sleeve detail is still very hot. I enjoy sleeve detail, but I always worry I’m going to accidentally put a bell sleeve into my soup. So, I’ve been having trouble coming up with things to write in these blog posts lately (I dunno why). So, I am asking for help. If you have a question they have been wanting to ask, or a topic you’re curious about, write it the comments and I’ll answer it. 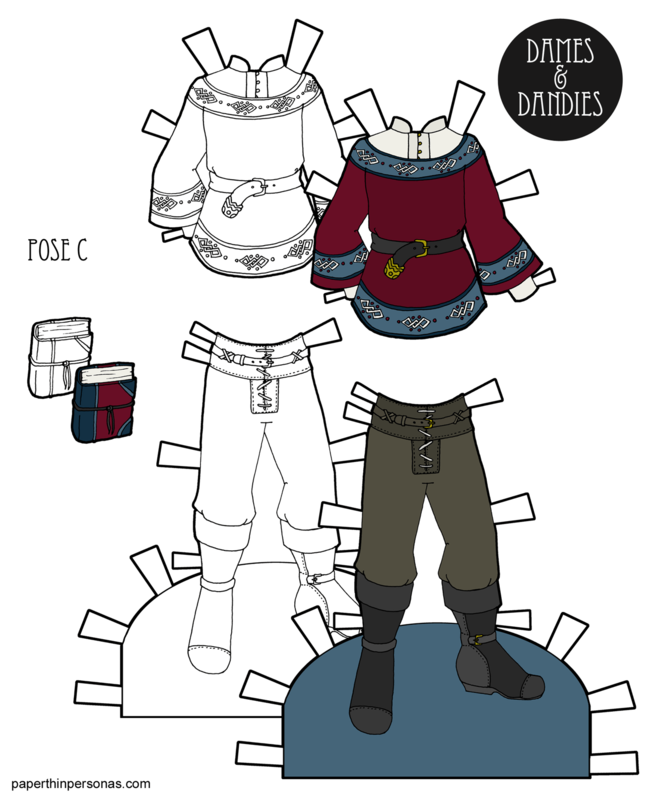 Of course, you’re also welcome to just comment about today’s paper doll or any of the paper dolls. I love to hear from y’all.